The Irish minister for finance has told the Dáil there will be 400 extra customs staff recruited before the end of the March. The hiring of some 200 more would follow soon after, minister Paschal Donohoe told the Irish parliament. These workers will be required to deal with a new customs systems resulting from Brexit. The minister insisted that the new staff will not be placed at or near the border with Northern Ireland. He said this was down to the Irish government not developing infrastructure there. Mr Donohoe insisted he would provide extra resources to the Republic's revenue service if needed. The minister said work on this scale has not happened in the economy for decades. 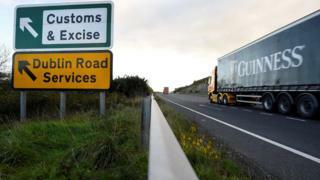 Earlier this week, the chief executive of Dublin Port said that if there is a hard Brexit on 29 March, the number of lorries travelling through the port from outside the EU would increase by 800,000 a year. Work is currently under way on new customs checkpoints in the port - the first to be built there in decades.